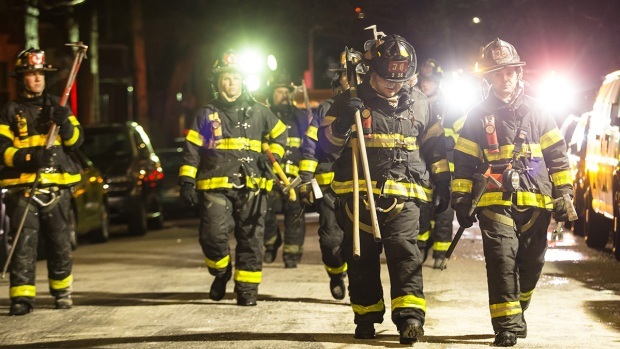 Twelve people, including four children, were killed in a fast-moving fire that ripped through a five-story apartment building near the Bronx Zoo on Thursday evening, fire officials familiar with the investigation told News 4 New York. Among the dead were three girls, ages 1, 2 and 7, an unidentified boy, three women, ages 19, 37 and 63, four unidentified men, and one unidentified woman, according to police. Officials have not yet released the names of the victims, but fire officials told News 4 at least three of the victims were members of the same family. 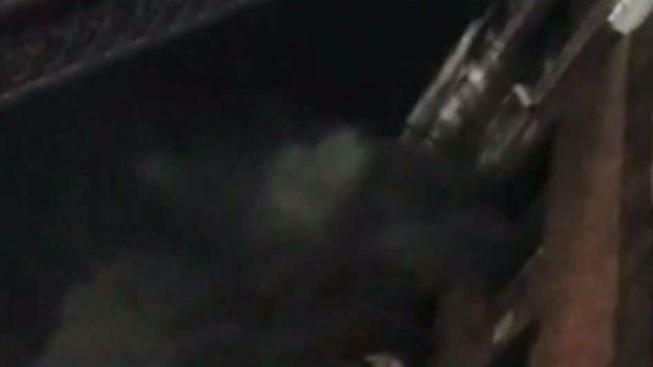 Another victim, officials said, was found dead in a bathtub after the flames were extinguished. 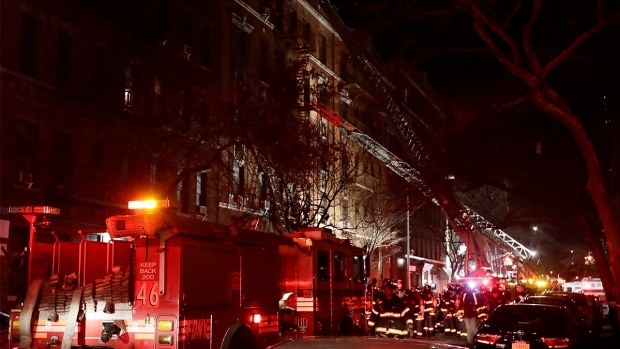 Four others were also critically injured after the blaze on Prospect Avenue near East 187th Street, which Mayor Bill de Blasio called an "unspeakable tragedy." A dozen others were rescued from the blaze with varying injuries but were expected to survive. "This is the worst fire tragedy we have seen in this city in at least a quarter-century," he said. "Based on the information we have now, this will rank as one of the worst losses of life in many, many years." He added, "We may lose others as well." 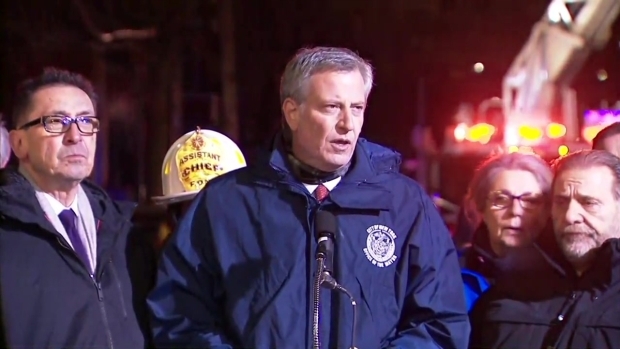 FDNY Commissioner Daniel Nigro called the fire "historic in its magnitude," because of the number of lives lost. Excluding the Sept. 11 attacks, it was the worst fire in the city since 87 people were killed at a social club fire in the Bronx in 1990 and surpassing the 10 who died, including nine children, in a four-story home in another part of the borough in 2007. Nigro said the flames Thursday broke out on the first floor of the building just before 7 p.m. and quickly spread up through the five-story, 25-unit building. "Our hearts go out to every person who lost a loved one here and everyone who is fighting for their lives," he said. The FDNY responded within three minutes and quickly knocked out the blaze, but the 170 firefighters who responded were unable to save the dozen people ranging in age from 1 to 63 years old who perished in the flames. Searches were set to be conducted later Thursday to see if anyone else was still inside the building. Dramatic footage from the time the blaze broke out showed onlookers yelling in support of firefighters as thick, black smoke poured out of a third-floor window. Thierno Diallo, 59, a security guard who lives in a ground floor apartment said he was home asleep when he heard banging on the door. It took a moment to realize what was happening. "Only when I heard people screaming, 'There's a fire in the building!'" he said. "I heard somebody (say), 'Oh! Fire! Fire! Fire!'" Witnesses at the scene said other residents including children could be seen running for their lives down fire escapes -- some without shoes amid temperatures in the low teens and even colder wind chills. Rafael Gonzalez said he ran to the apartment after seeing panicking people nearby as the flames spread upward from the first floor. "All I see is a bunch of kids on the fire escape, cold, with no jackets, no pajamas, no nothing," Gonzalez said. Maria Bonilla, meanwhile, said she saw firefighters frantically aiding burn victims and giving children chest compressions. "Burned," said Bonilla, visibly shaken. "They were all burned. Even little kids in the stretcher. Burned. It was crazy." The dozens who weren't hurt but managed to escape the flames were being sheltered by the Red Cross at a school about a block away, according to officials. Temperatures are in the teens in New York, with winds making it feel like single digits. In FDNY audio recorded by the service Broadcastify, dispatchers can be heard telling firefighters to stay in their rigs so they can keep warm. The cause of the blaze is still unknown, Nigro said. The building where the blaze broke out was cited by the city Department of Housing Preservation and Development for defective smoke and carbon monoxide detectors in August. The building had no recent relevant 311 or Department of Buildings complaints. 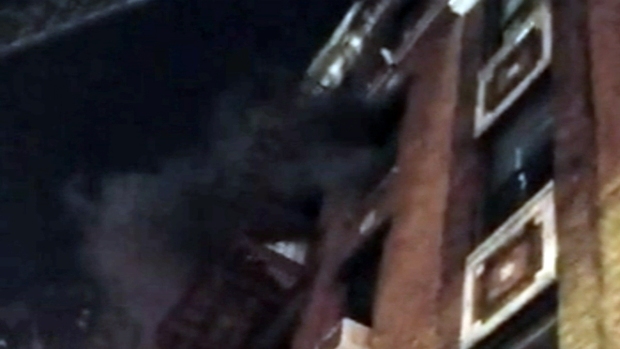 The fire is the third three-alarm blaze or greater in the borough in a day and half. On Wednesday morning, a fire ripped through a multistory home on Garden Street near the Bronx Zoo that forced residents to quickly flee, some still in bathrobes. That same morning, meanwhile, a second fire was burning, also at a multistory apartment building on Knox Place in the Norwood section of the Bronx.